It has been seven years since the Occupy Wall Street movement shook the US political and economic establishment, and created ripples of excitement in anti-capitalist movements across the world. However the movement seemed to ‘vanish’ as breezily as it erupted. Dennis Redmond recounts key features of the Occupy Movement – including it’s leaderlessness yet high self-organization, questions involving digital commons and digital citizenship, it’s rejection of the politics of a national empire and open affirmation of the politics of transnational solidarity, the string of uprisings that sparked across the US and large parts of the world post-Occupy – and investigates the claim that the movement was largely a flash in the pan, hyped up by a media spectacle. Seven years ago, tens of thousands of ordinary US citizens did something nobody expected. They had watched millions of citizens in northern Africa and Eurasia defy the tear gas, beatings and bullets of US-backed authoritarian kleptocracies. They had watched the livestream feeds of millions of human beings singing and marching for human dignity from Tunis to Cairo, Alexandria to Benghazi, Homs to Bahrain. They had watched mass democracy movements take down four dictatorships, and plant the seeds of a democratic future across northern Africa and Eurasia. And then a few dozen of those US citizens stopped watching. 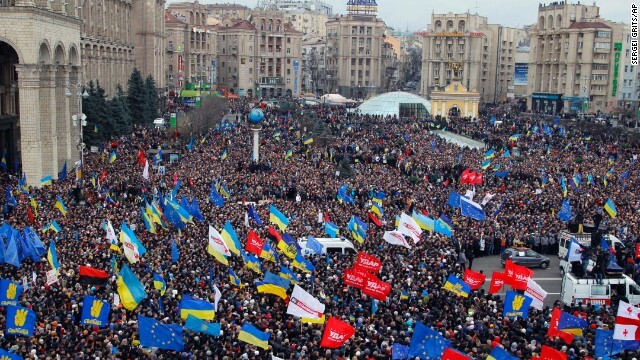 They turned off their TVs, walked to the nearest town square, and began to protest against their very own, homegrown, made-in-the-USA authoritarian kleptocracy. Dozens turned into hundreds, hundreds into thousands, thousands into tens of thousands. Eventually, hundreds of thousands of citizens occupied the centers of more than 150 towns and cities across the United States — most for days, some for weeks, and a few for months. Whether measured by the sheer number of participants or by the less definable category of cultural impact, Occupy was the biggest protest movement in the United States in decades. It dazzled the world with its energy, sophistication and creativity. Volunteers created and maintained a massive logistical infrastructure of livestreams, webcasts, podcasts and legal support teams; masses of protesters organized themselves into well-organized and self-regulated protest camps; while the Lie Machine otherwise known as the plutocrat-owned media (a media whose sole mission is to sell the advertisements produced by planet-destroying corporations) found itself outmessaged by the improvised networks of millions of digital citizens. Seven years later, in a landscape of the most extreme political revanchism, it would be all too easy to dismiss Occupy as a flash in the pan, a media spectacle which never turned into an actual political movement. This critique is misplaced on two counts. Firstly, Occupy vanished not because it failed, but precisely because it succeeded beyond anybody’s expectations (we will describe the measure of its success in just a moment). Secondly, Occupy cannot be separated from the larger arc of mass protests which began with the Arab Spring uprisings of 2011, and blossomed into the worldwide anti-capitalist protests of 2013-2014 (the mass protests of Brazil, Greece, Spain, Turkey, and Hong Kong, and the revolutions of Ukraine, Rojava and Kurdistan). These were movements of a fundamentally new kind: leaderless and yet highly self-organized, populist yet deeply cosmopolitan, and media-savvy yet grounded in the daily struggles of ordinary citizens. 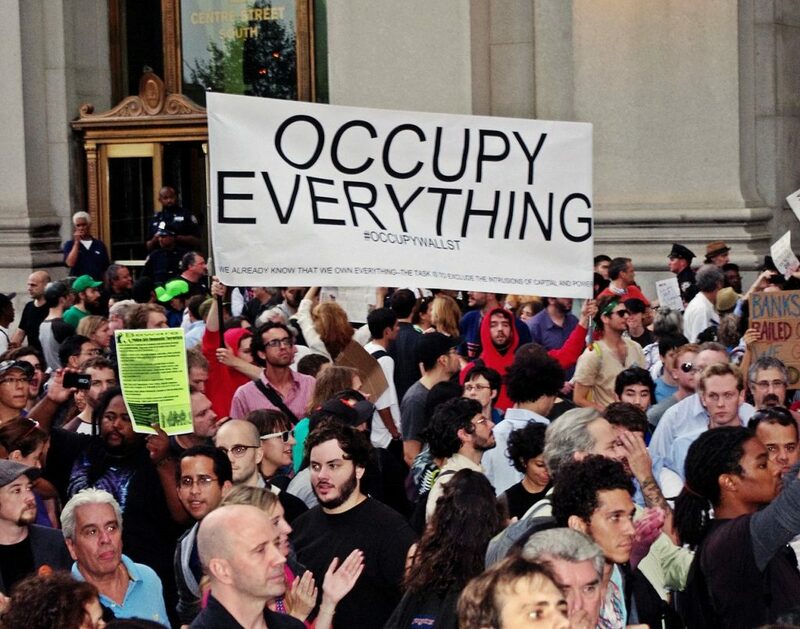 The roots of Occupy’s success can be traced back to its iconic refunctioning of the verb “occupy”. This term is normally used to denote the seizure of space by force or fiat (if space is used with consent, then verbs such as “dwell”, “reside” or “inhabit” are used), often in a colonial or imperial context. The Occupy protests used the term ironically, to signify the opposite of an unjust annexation. The protests staged the spatial liberation of downtowns, town squares, and other public spaces which in theory belonged to the public, but which in practice had been controlled for decades by real estate developers and corporate elites. This was a strategy invented by the indomitable citizens of Cairo, who transformed Tahrir Square from an empty, forbidding expanse designed to celebrate the might of Egypt’s praetorian postcolonial state into a dazzling theater of popular democracy. 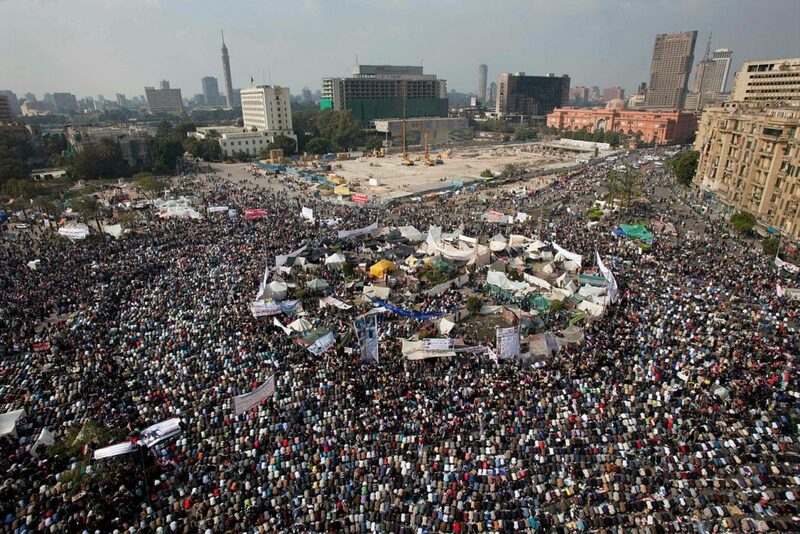 Egyptians didn’t just take up residence in their own square, they threw their country’s biggest moving-in party ever. Tahrir’s vast stony expanse blossomed with posters, placards, flags, drawings, obelisks, demonstrations, chants, songs, political discussions, meetings, poetry recitals, interviews and testimonials. In adapting the Cairo model of spatial democratization to its particular circumstances, the Occupy movement in the US made two innovations. The first pertains to a progressive politics of space – an amazing feat, because the politics of space in the United States have been horribly and irredeemably reactionary for centuries. This is due in part to the fact that the early history of the United States was characterized by continuous criminal land grabs, from the mass murder and exile of indigenous peoples to full-scale imperial wars (e.g. the theft of half of independent Mexico in 1848). The main reason, though, is that almost all of the progressive movements which emerged in America since the 1775 revolution took land theft for granted. The American revolutionaries were also continental land speculators; the abolitionists saw nothing wrong with wage slavery; many of the same Progressives who were critical of robber barons were also partisans of racist eugenicism and anti-Asian exclusion legislation; while the post-1945 US civil rights movement never challenged the plutocrat-friendly logic of suburbanization and housing bubbles. Occupy was the first mass movement in modern American history to openly reject the land-theft script. Its opening hashtag, #OccupyWallStreet, diagnosed the predatory financialization of space by Wall Street banksters as part of the decades-long looting of the American middle class by American plutocrats. Its theatrical re-habitation of downtown squares diagnosed the despoliation of America’s downtowns by hideous glass boxes and soulless corporate towers. Its concluding call to #OccupyTheWorld was the 21st century reinvention of Marx’s famous mandate to “expropriate the expropriators”. The second major innovation of Occupy was to transform the most advanced tools of the digital commons into the tools of digital citizenship. For every US citizen who participated in a downtown protest camp, ten watched on internet streams, a hundred followed in chatrooms and a thousand on social media sites. These audiences quickly began to function as semi-autonomous learning networks, by selecting the most effective and memorable slogans and speeches, co-producing and fact-checking the latest news, and collectively theorizing the latest and most up-to-date tactics. This extraordinary audience mobilization is what enabled Occupy to turn the single most powerful weapon of the plutocrat-owned mass media — its control of the prevailing political discourse — against itself. During the 1980s, the plutocrats had redefined US politics away from the discourses of the 1930s New Deal and the 1960s Great Society, and towards the neoliberal discourse of financialization. By the early 2000s, both mainstream US political parties had become different brand names for the same underlying policy of enriching plutocrats while immiserating commoners. Occupy upstaged the discourse of financialization by deploying the discourse of transnational populism. This was a populism which did not hearken back to an exclusive nationalism of the few, but which looked forward to the global solidarity of all with all. One of the most striking expressions of this solidarity was Occupy’s key slogan, the seemingly apolitical but in reality deeply subversive “We are the 99%”. This slogan did more than just assert the dignity of the plebeian masses over the greed of kleptocratic elites. The pronoun “we” implicitly links the struggles of 325 million Americans to the 7.3 billion other human beings who work for a living on this planet. The effectiveness of Occupy was stunning. Within a few weeks, significant majorities of the American public shifted from mild puzzlement to sympathy and outright approval of the Occupy movement. Whereas it took two decades for the post-1945 civil rights movement and ten years for the anti-Vietnam War movement to build majoritarian support, . 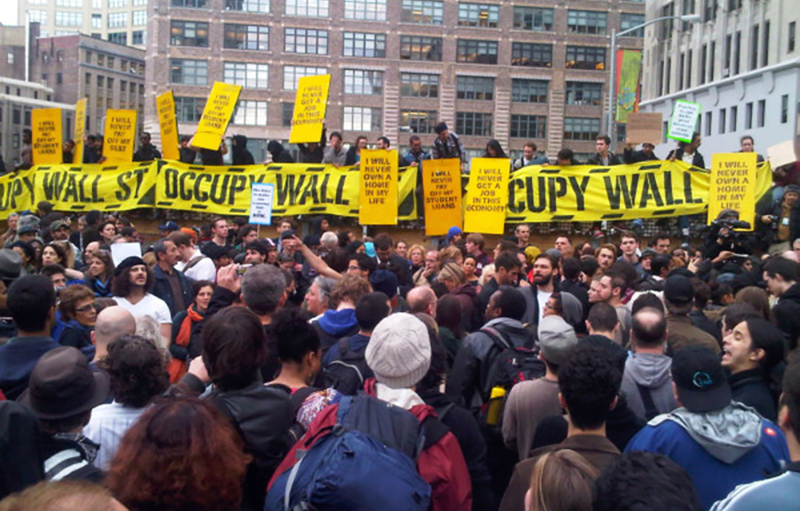 Occupy changed the landscape of American politics in two weeks. This massive success helps to explain why Occupy vanished as quickly as it did. Simply, the discursive framework of transnational populism functioned as a kind of ideological and organizational commons for a wide range of concrete anti-capitalist struggles, everywhere from funding public education (which includes the ongoing struggles against school testing) to health care for all (the struggle for access and against medical profiteering), and from public infrastructure (the Flint protests around the lead poisoning of drinking water, and the struggle for renewable energy) to political governance (the struggles against authoritarian kleptocracy and against the carceral racism of the war on drugs).